Course tickets allow you to sell tickets to all dates and times in an entry. 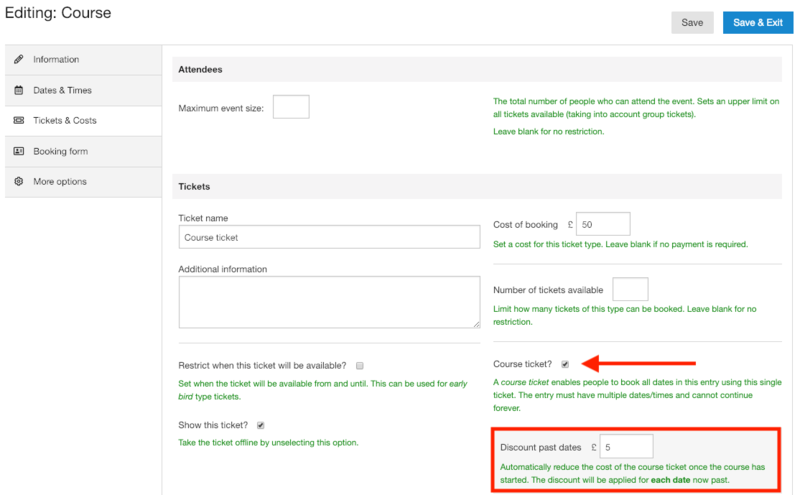 If you accept attendances mid-course then you might want to use this feature to automatically reduce the course ticket price as each date passes on the entry. Tick the box for 'Course ticket'. PS, make sure you've saved your entry with at least two dates before creating the course ticket. You'll now see a setting called 'Discount past dates' (see below image). This is the value we want our course ticket to decrease by for each date that passes in our course. In the example below my course ticket is £50, and there are 10 dates, so I've decided to discount by £5 for each date that passes. So, for example on date 3 of the course, the ticket would cost £35 (3 x £5 discounts from £50).